across the southeastern United States. 12,000 frequently purchased items that address the everyday needs of its customers. Fred’s Brand products, and lower-priced off-brand products. medication therapy management (MTM), and Medicare Part D education. Customers know us as a great place to save time and money. Our team members know us as a great place to work. 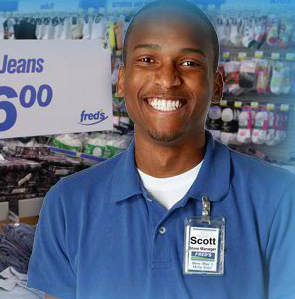 From store and pharmacy positions, to careers in our store support center and distribution facilities, Fred's offers something for everyone. We're a fast-paced, fast-growing company with opportunities for growth and the chance to work with great people. Care to join the team? Join here. It's our vision to put a smile on every customer's face. And on the face of every team member. Join the Fred's family and find out what our customers already know—that Fred's is a great place to be.